January 16, 2013 at 3:06 pm EDT | by Lou Chibbaro Jr.
D.C. police have so far declined to confirm whether they have tracked down the license plate number of a car driven by a suspect that multiple witnesses have said is systematically removing bundles of the Washington Blade and Metro Weekly magazine from distribution boxes throughout the city. Blade publisher Lynne Brown said she and others have given the license plate number of a white Toyota Camry and a description of its middle age, white male driver to the police Gay and Lesbian Liaison Unit. She has not heard back about whether police have traced the identity of the driver or owner of the car, Brown said. D.C. police spokesperson Gwendolyn Crump said in a statement late Wednesday that the police department is “very committed” to addressing reports of vandalism against the newspaper boxes. Inquires about the status of a possible police investigation into the removal of large quantities of the two LGBT publications from their distribution boxes follows reports in September that Blade and Metro Weekly boxes also were being vandalized in the Dupont Circle, Logan Circle and 17th Street gay entertainment areas. Brown said one or more suspects have been systematically breaking a clear plastic clip that holds a single issue of the Blade in the window of the distribution boxes, allowing readers to view the front page of the paper to find out when the new edition is delivered each Friday. She said the vandalism is continuing. Metro Weekly co-publishers Sean Bugg and Randy Shulman didn’t reply to a Blade email seeking comment this week. In a Metro Weekly story in September about the vandalism and thefts, Bugg said one or more vandals had deposited trash and human or animal feces in some of the LGBT publication’s boxes. The article, in which Bugg described the vandalism as an anti-LGBT hate crime, said Metro Weekly was expending large sums of money to clean and sterilize the distribution boxes, only to have the perpetrator or perpetrators vandalize the same boxes again. Brown said GLLU members have told her informally that the removal of a free newspaper from a distribution box doesn’t appear to fall under the definition of a theft, even if large quantities of the paper are taken. Brown said she was told that the United States Attorney’s office was being consulted to advise police over whether a suspect could be arrested and prosecuted for removing a free publication from a distribution box. “I would like the owner of the car identified and an arrest warrant sworn out,” she said. William Miller, a spokesperson for the U.S. Attorney’s office, said he would make inquiries about whether prosecutors in his office were looking into the matter. 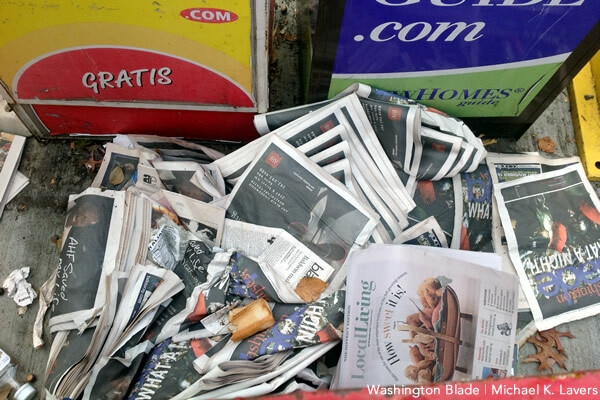 Brian Moore, an aide to D.C. City Council Chair Phil Mendelson (D-At-Large), said Mendelson would be open to studying whether the Council should consider legislation to make it illegal to remove large quantities of a free newspaper or other publications from distribution boxes. The Metro Weekly article suggested that the motive behind the removal of large quantities of the magazine from its boxes appeared to be anti-LGBT animus in at least some of the cases because stacks of the magazines were found in city trash cans near the site of the boxes. Brown said another possible motive could be the potential sale of bulk quantities of newspapers to recycling centers that pay for newspapers. An aide to D.C. Council member Mary Cheh (D-Ward 3), who monitors the city’s recycling programs for Cheh’s Council Committee on Transportation and the Environment, said most commercial recycling centers don’t pay for newspapers unless they are delivered in quantities of at least one or more tons, making it difficult for an individual to carry out such a task in a private car or even a small truck. Read it for yourself, folks. DC’s hate crimes law is as clear as a bell. Note well… injury to property, theft or conspiring to commit those offenses is SPECIFICALLY included. MPD, at its highest levels, has long been ignoring this law. The lame MPD excuses and fuzzy-wuzzy legal obfuscations given to the Blade are familiar to a number of us. The Washington Blade is discovering what victims of anti-LGBT violent hate crimes in DC over the past 6 years have long suspected. MPD is apparently engaged in a quiet, institutional homophobic and transphobic bias against LGBTQ people and their business stakeholders in DC. MPD is simply ignoring effective enforcement of DC’s hate crimes law as applied to LGBTQ residents and visitors. Let’s just ask a simple question again and again– how many of DC’s anti-LGBT hate crimes over the past 6 years have been closed with an arrest? All District residents and especially LGBT residents and visitors are entitled to know that. Let me be very clear. This MPD institutional homophobia and transphobia does NOT emanate, nor “bubble up” from ‘rogue’ rank and file MPD officers, anxious to sacrifice the honor of their life’s work, their families’ livelihoods and their retirement benefits by ignoring what their chiefs really want them to do. Nor does it come from our dedicated GLLU officers– who must always follow their MPD chiefs’ orders– or else. Perhaps for political reasons, but whatever his reason, Mayor Gray is tacitly complicit in this institutional anti-LGBTQ MPD bias. LGBT voters should recall that Mayor Gray’s first broken promise was to DC’s LGBT community, when he failed to consult GLAA, GLOV and other DC LGBT public safety stakeholders in his selection of a police chief. LGBT residents of, and visitors to our Capital City have been paying a heavy, violent price ever since. That number now includes hate crime attacks on DC’s LGBT news media publications. We don’t need any more new laws, Chairman Mendelson. We DO need you, CM Cheh and CM Wells– as well as ALL of our council members who purport to be LGBT ‘allies’– to EFFECTIVELY exercise COUNCIL’s POLICE OVERSIGHT responsibilities to end anti-LGBT hate crimes in DC. Moreover, it is long past time that we ask President Obama why his Justice Department is ignoring anti-LGBT hate crimes in our Nation’s Capital. Of all cities in these United States, Washington, DC should be a welcoming and safe place for LGBT visitors and tourists– from every city, village and hamlet across our country– and from all over the world. It is not. But let someone start stealing some of the free African-American publications and see how quickly the MPD acts. From Lanier on down it is quite clear, GLBT issues are of no concern to the MPD.